The story begins with me being called in to investigate a wet basement. The client had spent a good deal of money with a contractor ten years earlier to underpin and waterproof their basement, but there was seepage. They’d paid for rough-ins on the plumbing, but there was no venting and the toilet drain sloped backwards. The mechanicals weren’t working properly, and so they weren’t getting decent cooling on the upper floor. They had called the contractor back to the home twice without any change in result — in short, they were just about ready to write off the basement altogether. After reviewing almost daily pictures of the 10-year-old construction, I saw a lot of things only a seasoned builder would notice. Weeping tiles higher than the footings that did not go anywhere; rough-in plumbing that was poorly laid out and devoid of vents; squirrel cage electric motors on a run of ducting that didn’t go anywhere; and most obviously a set of stairs that were not to code and which the client and their children had wiped out on. The water seepage problem was sorted out with an interior weeping tile system with sump pump and we installed a back water valve at the same time, ensuring they would never have a sewage backup. 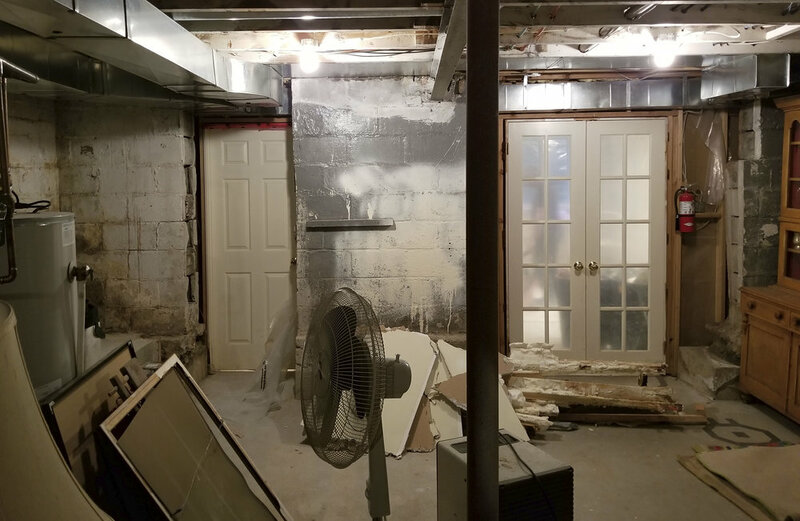 The improper plumbing was newly laid out by breaking approximately 15% of the entire basement’s 4” concrete slab (with hydronic heating tubes in it!). And the leak-prone Kitec hot and cold water lines were replaced with new Wirsbo ones. The mechanical systems also needed attention — we reorganized the entire area (with the exception of the forced air gas furnace). We relocated the central vacuum to where it could be properly cleaned with ease, and installed a dual purpose high-efficiency water tank that manages both domestic hot water and the current basement in-floor heat, and in future will handle the second and third floor bathrooms’ hydronic heating. These are the kinds of improvements that will never show up in photographs but are nonetheless vital. The ducting to the third floor was enhanced with two new runs, and combined with a new return from the same area to enhance cooling and air exchange. The panels for the electrical, internet, alarm, phone and cable were consolidated to provide one central panel for electrical behind a pair of Maple doors, with the internet, alarm, phone and cable panels morphing into one easy display board in the mechanical/storage room. And then, with the water seepage problems remedied, plumbing, electricals and mechanicals optimized, we implemented a series of transformational upgrades to the space. With thirty years of designing living areas under my belt, I’ve become somewhat of an expert on how to make smart use of space. I will always develop an understanding of a client’s particular storage needs — every family is slightly different depending on things like hobbies — but then there are features that are universally appreciated, such as cedar closets, and deeper storage for empty luggage. This basement offers all kinds of storage, including space for overflow kitchen gear, sports gear, seasonal ware, and special event props. It’s amazing how a well-organized basement can reduce clutter throughout the house and make the upper floors look better. But what good is a basement for storage if you dread the thought of going down there! So, we gave it beautiful 1000-grit polished concrete floors — coated in Bellatrix, which gives it a luster and prevents stains from wines and oils — which are warmed in the wintertime, feel great underfoot and have the added benefit of warming everything that touches them. An epic home theatre is more easily achieved than many people think. And with little to no natural light, the basement is the ideal location. To prevent sound from filtering through the rest of the home, we added two layers of Roxul “Safe and Sound” insulation to the walls and ceiling. To counter the acoustically bright drywall and concrete floors, we used 150-year-old pine barnboard as a sound attenuator to tune the room. In this case, it’s reclaimed from an Ontario barn in Orillia. Reclaimed pine has a huge surface area due to its eroded face, making it ideal as a sound soak insulator. Of course it also looks fantastic! 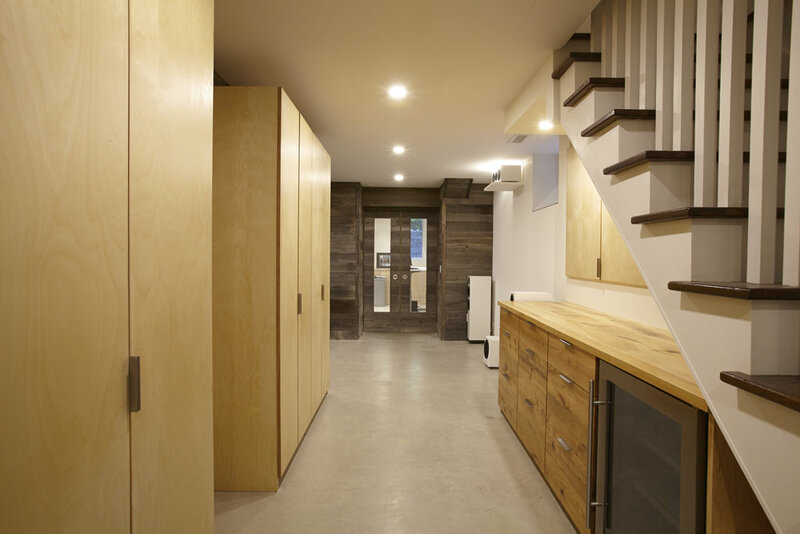 In a basement there are often irregular space constraints, such as in the area where we put the washroom where we had what’s called a ‘bench footing’ — making it a bit of a challenge to find the right storage and floor solutions. As a result, one of these closets is 36”-deep for really large objects, such as empty luggage, and another at 24”-deep is for towels and linens. The toilet paper holder, recessed into the wall, is an example of a small touch that helps make the space work where it is tight at the W.C. The owner operates a business and wanted the ability to work from home using a stand-up desk. We created a tranquil space largely by considering the little things. We solved the wire management challenge of bringing receptacles into a concrete floor that had already been poured by using conduits. We projected where the desks would be prior to installing the overhead lights. And we gave each of the windowsills a mirrored surface, for two reasons: Drywall windowsills tend to get dirty, and a mirror provides a complimentary light-bounce, allowing sunlight deeper into the room. Using reclaimed Douglas Fir rough-sawn with a white wash helps as a sound soak and looks great as wainscoting around the perimeter. 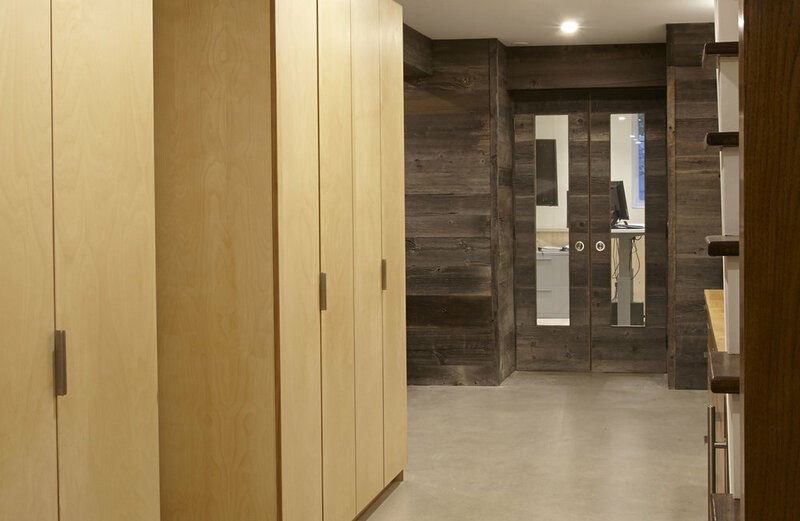 The pair of doors matching gray barnboard to the main living area and Douglas Fir white washed inside the office help keep business and family sounds from co-mingling. Slide the bar left/right to reveal the transformation. I remember the euphoric high when the barnboard got delivered — the client exclaiming “Oh I love it! !” even before we started applying it to the walls. Contrast that with the devastating moment two months earlier when they’d learned that the existing concrete would have to be torn up… Oh no!